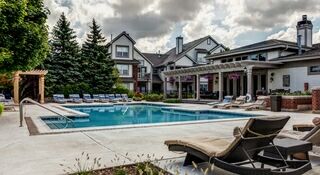 Inside and out, The Aventine at Oakhurst North in Aurora near Naperville, IL offer resort style features perfect for any lifestyle. Human and four-legged residents of The Aventine alike can enjoy in an array of amenities centered on luxury and convenience. The newly renovated resident clubhouse features a complimentary coffee and tea bar and a business center with complimentary printing and comfortable seating. The state-of-the-art fitness center is open 24-hours to residents. This facility features top-flight cardio and strength training equipment, as well as circuit training and WellBeats™ Virtual Fitness Training programming. For a lower impact workout, enjoy access to a year-round, indoor pool. The Aventine also features Luxer Package Lockers, so you have 24-hour access to any deliveries to your home. Outdoors, relax in the sun at the furnished sundeck or take a dip in the adjacent swimming pool. If you’re looking for a little shade, enjoy relaxing under one of two pergolas near the pool. On cooler evenings, hang out at the outdoor fire pit. Enjoy a meal with friends or fellow residents at any one of the outdoor grills and dining areas, or simply stroll professionally maintained grounds. The Aventine also features an on-site playground. Even pets at The Aventine enjoy luxury apartment features unique to Aurora. Visit the fully enclosed pet park featuring agility course features. Residents also enjoy access to a complimentary pet wash station and multiple pet waste stations throughout the grounds. The Aventine is a pet-friendly community with no weight limits for cats or dogs. We welcome most breeds of dogs. However, because certain dogs do not thrive in a community environment, we cannot accommodate the following breeds, dogs resembling these breeds, or mixes of these breeds: Akita; American Staffordshire Terrier; Bull Terrier; Chow; Doberman; German Shepherd; Pitt Bull; Presa Canario; Rottweiler and Wolf Hybrid. Exotic/farm animals are not allowed in the apartments, either.